Here are some pens from the post-"dollar" pen era 1944-1948. These are often called "Transitional" because of the flat bottomed barrel and the more streamlined cap, and represent a series of transitions from the Visumaster through the Twist Filler to the most common double jewel J. These came in several varieties, of which I'll try to show some variations here. The first in the series of transitionals, with a three ribbed jewel and the R. Esterbrook + Co. Imprint. Later this changed to the transitional Esterbrook imprint. The third variant in the transitional series switched form the three ribbed jewel to the more traditional round jewel as found on the double jewel J's. The fourth and last variant added the Esterbrook name to the clip, as in this red example. This is an unusual nurses pen in the fourth transitional variant. This is an unusual transitional in that it has a round metal jewel rather than the traditional plastic jewel found on examples above. I suspect this may have been done after the fact by a repair person, as I have never seen a similar example. Here is a close up of the cap to show the jewel. Transitional caps came in different varieties. The left cap is an early transitional with a three ribbed jewel. These jewels unscrew from the cap making clip adjustments easy. Some of these three ribbed jewels have a reddish hue to them, although I'm not sure why. The second cap is the metal jewel pictured above. 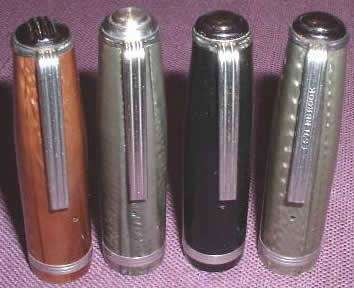 The third cap has the more familiar round jewel found on the J series pens, but note, the first three caps do not have the Esterbrook name on the clip. The final cap is from a transitional pen, but is nearly identical to that of a J series cap. It has the round jewel and the Esterbrook name on the clip. These last generation transitional caps also have jewels that unscrew.